On how to engage in philosophical debate in a religious setting. 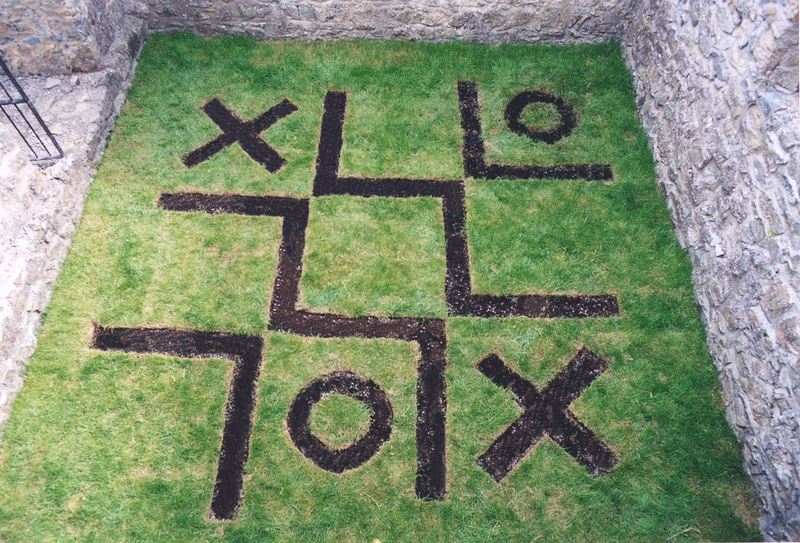 Tic Tac Toe is a drawing in a Christian priory that references Celtic land art, using prominent symbols from both traditions. The symbols of the circle mixed with the cross are common to both the Celtic and Christian cultures. The grid itself is either a cross or a set of connected zig-zaging lines. The game is about competition between two symbols; the x and the o. These symbols could be read as any set of opposing ideologies. Yet that the game is played implies a consensus, a dialogue, interaction of 2 parties. A belief in a common set of rules or an actual framework is apparent in the game by virtue of its grid system. Systems of thought or opposition may be contested within the authority of the grid. The grid in this sense refers to common experience. Questions of faith and territory will be contested and argued for as long as there are differing opinions. This is and has been a constant on this island. The self conscious gravitas with which these issues are discussed is underscored by the trivial nature of the tic tac toe game. 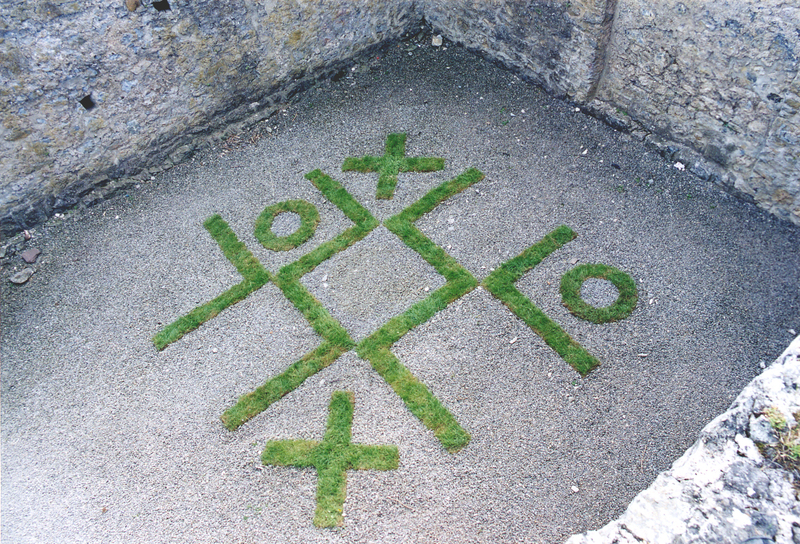 Tic Tac Toe is flippant as a metaphor for conflict, but at the same time it belies the folly in censuring one system of belief over or in regard to another. 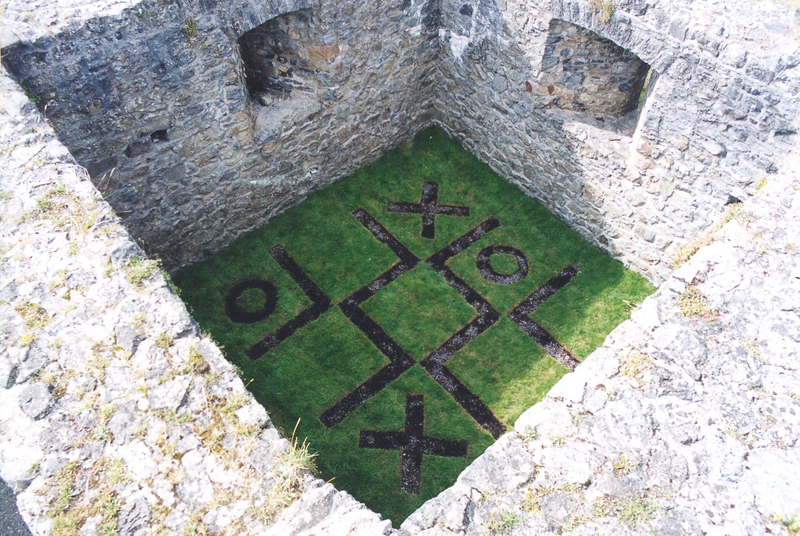 Tic Tac Toe may be construed as a playful take on the politics of religion, belief, territory, ownership, land art, the endless possibilities of stalemate, set beside the inevitable obsolescence of human debate in the long term face of time and nature. That the priory is a ruin is testament to ambivalence of time to the fundamental philosophical and political debates of man.